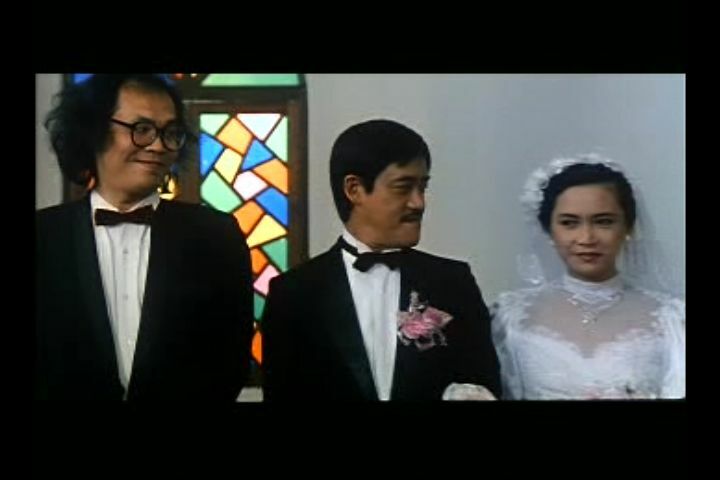 To be fair, only one of them is getting married to Deannie Yip here. The other one is just along for the ride. And speaking of rides, before the actual wedding vows can be exchanged, the buddy cop partners get a call on their pagers and immediately leave the bride at the alter. They jump into their souped-up Police Bridemobile (TM pending) and rush to the scene of a suicide attempt. More buddy cop movies should have bridemobile chases. "Lend me your lipstick and make-up pencil"
then he talks the suicidal jumper down by pretending to be his gay lover. How does that even work? And more to the point, what is director Philip Chan trying to establish at the start of The Return of Pom Pom? 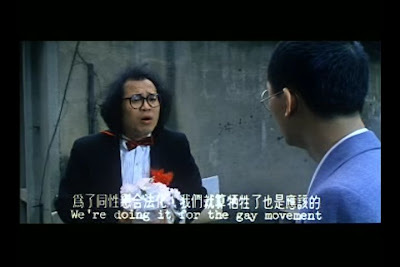 Philip Chan basically sets up the first scene of The Return of Pom Pom to proclaim that it's much better to be alive and miserable than to be any kind of gay. Think about it from the jumper's point of view: He's in suicidal despair. He doesn't care about anyone or any thing. He's ready to end it all. But then along comes Beethoven who accuses him of being gay. If I die now, he thinks, everyone will think I was gay! "We're doing it for the gay movement"
So he changes his mind! It's as simple as that. Living with the torture of suicidal despair is much better than posthumous assumed gayness, apparently. 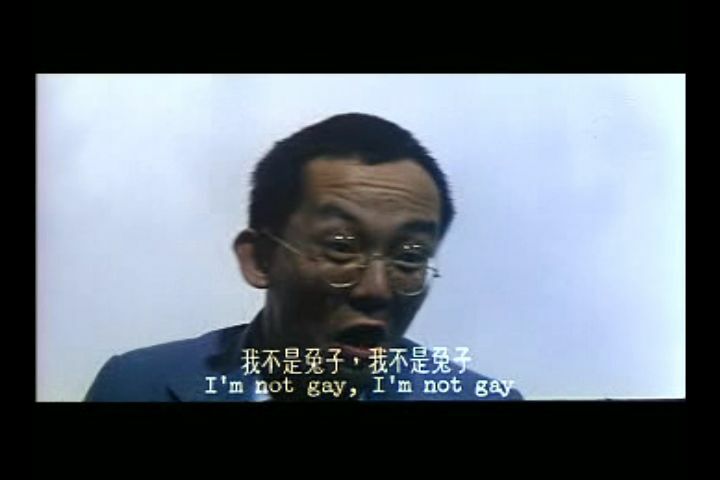 "I'm not gay, I'm not gay!" To paraphrase Queen Gertrude in Shakespeare's Hamlet, "This movie doth protest too much, methinks!" 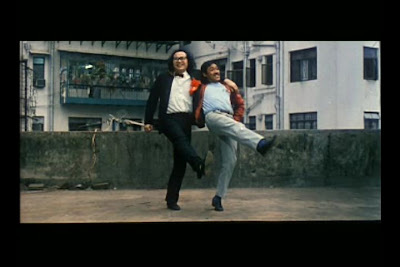 Beethoven and Ah Chiu celebrate their not-gayness on the rooftop. Wasn't one of them supposed to be getting married? Um . . . ok? 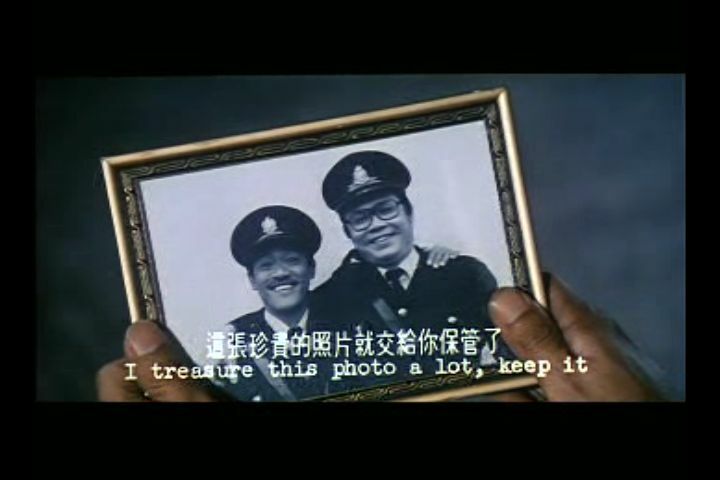 But this is also a police buddy film, which means there's a rather convoluted crime for them to solve. 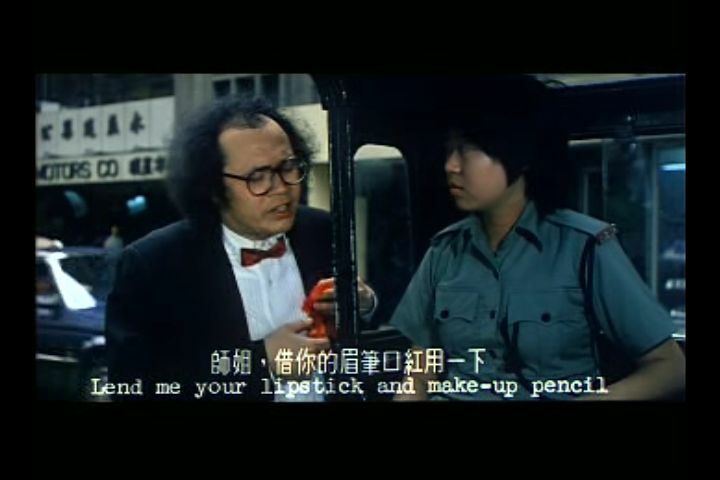 Lam Ching Ying plays a bad guy named The Flying Spider who has stolen some police evidence. Beethoven and Ah Chiu (do you need a tissue?) have to get that evidence back! This involves some of the most ridiculous police work you've ever seen, such as a police investigation that involves dressing in outdated swim-wear and whistling the tune "Tea for Two" at various guys. Yes, there's a lot of definitely-not-gay police work in The Return of Pom Pom. "You're here? Good. Remember my turtles?" Out-of-nowhere lines like this make me love Hong Kong cinema even more! Beethoven ready for his heterosexual encounter. Honestly, this is all rather tedious and slow, and not really very funny. 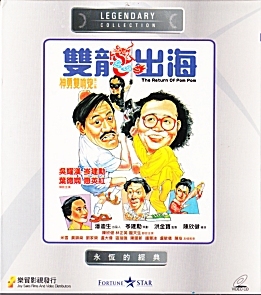 The movie finally picks up near the end, when they confront The Flying Spider, Lam Ching Ying, who is pretending to be paralyzed. 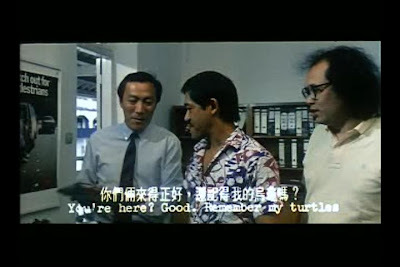 By the way, Lam Ching Ying is one of Hong Kong cinema's best fight choreographers, and his presence in this film makes the whole thing a lot more bearable! 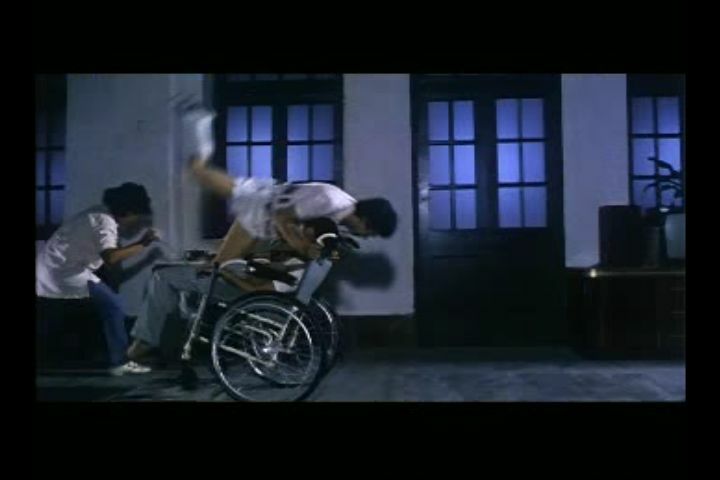 If anyone can pull off a paraplegic fight scene, Lam Ching Ying can. But Lam Ching Ying quickly gets bored of pretending to be paralyzed, so he starts fighting like normal. But then he apparently gets bored of fighting like normal, so he ends the fight scene in one of the silliest ways I've ever seen. 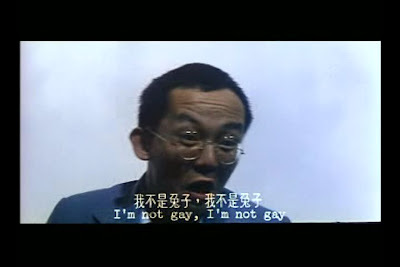 Bottom Line of this Chinese Movie Review: It's silly and mildly amusing at times, but the whole "we're not gay" thing can get really tedious after a while.